You can perform a six-day workout routine to help you build muscle, lose fat or get in shape. However, in order to achieve the best results possible, make sure you design your workouts with your goals in mind, that you train with intensity and consistency, and that your workout fits your schedule and lifestyle. The six day body part split is common among professional bodybuilders. Break down your body into six individual parts which you can work in each training session. For example: chest, back, quadriceps, shoulders, hamstrings and calves, arms. Once you have finished the six-day cycle, rest on the seventh day, then start again with your chest workout on day eight. While each body part is hit infrequently, you can perform a lot of volume in each training session. Strength coach Mike Mahler advises that high volume training is not for beginners, but is essential for advanced trainees. On days one, three and five, perform full body workouts based around compound free-weight exercises such as squats, dead lifts, presses and rows. On days two, four and six, perform light cardiovascular training such as jogging or cycling, then repeat the cycle on day seven. Trainer Chad Waterbury recommends full body training when muscle gain is your main goal, as the high frequency can stimulate more growth. A push, pull, legs routine requires you to train your chest, shoulders and triceps on days one and four, your back and biceps on days two and five, and your legs on days three and six. 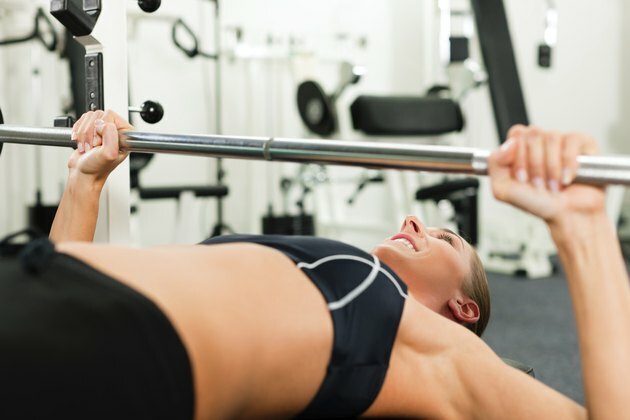 This routine is ideal if you are an intermediate trainer, as it has a higher frequency than a body part split, and a higher volume than a full body workout. According to mixed martial arts coach Marcus Fisher, you can perform body weight exercises such as chinups, dips, squats and planks every day. For each of your six days, set up a small circuit consisting of the aforementioned exercises, and perform as many good quality repetitions as possible on each one. Avoiding training to failure, or doing the exercises with bad form, as this can lead to fatigue and injuries. Perform the circuit three times on each of the six days, then have a day's rest.